My friend “Auntie Serena” is back with Part 2 of Something from Nothing: Thrift Store Finds. I learned a few things from these tips and I think you will too. Share your best new wisdom in the comments, we would love to hear what you learned. Ah, the joy of the thrift store! I am not talking about giant Value Village, or even Sally Ann—although these are great for toys and clothes. I mean the thrift/antique store, probably located where your grandfather used to buy hardware before Walmart came to town. 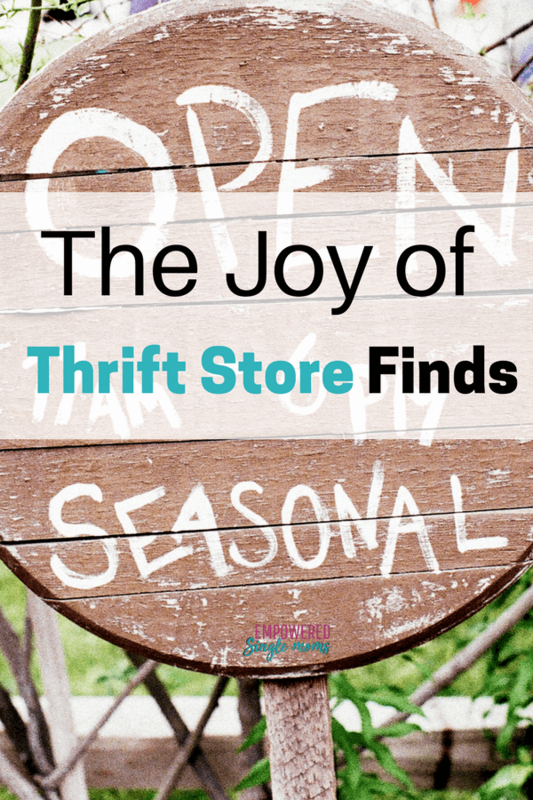 A small-town Main Street thrift or antique store is a great destination for a day off. More relaxing than an estate auction or yard sales, the thrift store afternoon is best enjoyed with a gal pal and capped off with a cup of good coffee, something sweet, and a mutual admiration of treasures. The thing I love the most about vintage stuff is its link to the past. I look for things that take me somewhere else, make me smile, and dream up the stories they might tell if they could. 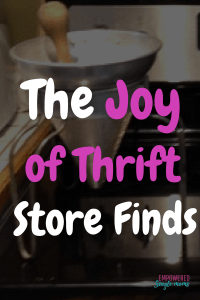 We can also use thrift store treasure hunting as a way to save money if we look for ideas of what we could create, reuse, re-combine, and bring to life once more. Here are some of my favorite secondhand scores. In the “making something from (almost) nothing” department, old lace is a superstar. Don’t you love handling something that some other woman made by hand? As I repurpose lace, I wonder who the maker was and what she thought about as she worked. It’s like holding hands across time. With no sewing skills except the ability to thread a needle and hope for the best, you can catch the outside points of a round doily with thread and attach it to an embroidery hoop (also found at the antique store). Or, you can take any small piece, back it with tissue paper, put it in a picture frame, and hang it in the window so the light shines through it. 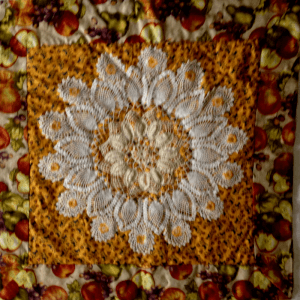 If you are more confident with sewing, you can cut a square of fabric bigger than the lace, layer it with batting in the middle and more fabric on the back, pin it all together very firmly and create a one-square wall quilt. If this sounds complicated, find a quilter to show you how and to encourage you (quilters love to recruit). As quilts go, this is so easy that it’s almost cheating—someone has already done the hard part by making the lace. It will be beautiful. You will love it and your friends will want one too, leaving you no peace. My favorites are the special fundraiser books that were printed for churches, schools, or community groups. Look for canning recipes, as well as baking, meals, and sweets. Canning may seem fussy, but it’s easier than you think and it’s a creative, healthy and almost-free way to fill your cupboards and create gifts for teachers, grandparents, and friends. 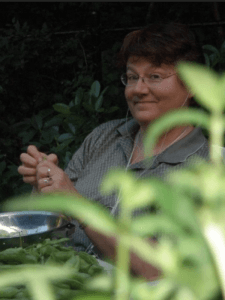 Use the old cookbooks for inspiration, but do look up the new rules for food safety, we’ve learned a lot in the last 100 years about food safety. A colander is a cone-shaped metal sieve, some people call it a chinois, but where I grew up it is a Colander. It comes with a stand to hold it upright and a wooden pestle that should fit neatly into the point of the colander. These are very hard to find new for a good price. Mine is aluminum and looks like it has been around since at least the 1950s. This type of colander is used to mush up cooked apples and pears into the best apple/pear sauce. It feels and tastes much better than anything from the store or made with a food processor. 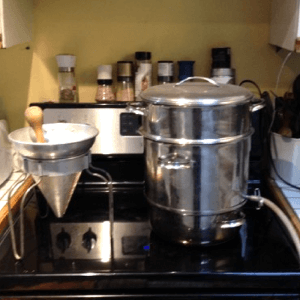 You can also use it to strain pasta or beans. If you can make applesauce, you can make fruit leather. The key ingredient is apples—you can mix any other fruit in with them for flavor and color, but the apples have enough fiber to hold it together. You can make fruit leather in the oven on waxed paper, but if you are like me and tend to forget about what you left in the oven, you will want a dehydrator. We make yards and yards of fruit leather each year, with no added sugar or honey. Kids love it! We have even traded it for eggs and homemade bread. A steamer-juicer is a rare item to find secondhand, so if you find one, grab it and take it home! This is a large, three-part metal contraption that uses steam to extract juice from fruit or to cook meals. You put the fruit in the top part, which is shaped like a basket with holes in the bottom. Just below that is the part that catches the juice—it looks a bit like an angel food cake pan. The bottom pan is flat on the bottom and holds about a gallon of water. A lid fits on the top and has a spout with a rubber tube that comes out of the middle layer so that you can drain the juice directly into sterile jars. My steamer-juicer is my favorite food processing thing. I throw apple chunks and any other fruit that is in season into the top, fill the bottom with water, and put it on the stove for an hour or so until the fruit is mushy and the juice is ready. I have jars, lids, and a water bath ready for canning. The fruit pulp goes through my wonderful colander and becomes sauce to be canned or turned into the world’s best fruit leather. It’s also good for a quick meal of meat, potatoes, and veggies steamed together. There will be a lovely broth to pour over it all or to save for soup. Carefully snip off buttons, beads, ribbon, and embroidery. These elements can be reused to make pillow covers, wall hangings, quilts, stuffed animals, bags, or even to decorate new clothes. Use some of those mason jars to sort and display your finds. Two common ways to upcycle old sweaters are felting and unraveling the yarn for knitting. To felt an old sweater (it must be wool), take it apart and wash the heck out of it in hot water. Do everything that your mother taught you to never do to sweaters: beat it, rub it, brush it, and put it in the dryer. Eventually, it will become thick slabs of woolly felt that can be cut without unraveling. These slabs can be stitched together to make fun things, like mini bags, stuffed monsters, or fairy-tale scenes. Here is a book if you need more inspiration on. You can felt balls of wool yarn in much the same way. Put them in a pillowcase to wash the heck out of them until the yarn sticks together. Then, if you have a source of colored, carded but not spun wool (or white wool that you can dye yourself), and a felting needle, you can decorate these balls beautifully to make baby toys, Christmas baubles, or dryer balls. Needle felting is an amazing, quick, and beautiful craft—look it up on Etsy and Youtube for more details. If you want a book instead here is a beginner’s guide to repurposing knits. Your children will need great toys if you are going to have time to do all of that cooking and crafting. Wooden blocks are the very best. At antique stores, you might also score like Lincoln Logs or Tinker Toys. Or you might find the Holy Grail of thrift shopping—a big plastic tub of the original, primary-color, Legos WITHOUT INSTRUCTIONS. New purses cost too much. Thrift stores have an ever-changing variety, hopefully vintage. My personal favorites are the upcycled seat-belt purses that I have found: a black one, a red one, and an orange one. They are indestructible. The bonus is their conversation value—what kind of car had orange seatbelts? Don’t pass up the jewelry case! Every thrift store has a container of lapel buttons, usually on the front counter, and usually cheap enough that you can let your children choose one. Wear the jewelry by all means, but also consider upcycling it into crafts. Can you hot-glue these gems to picture frames, Christmas wreaths, or a collage for your grandmother? Can you take apart strings of beads, sort them into mason jars, and restring them into new creations? Make big, sparkly brooches? Belt buckles? Fill paperweights with them? Make a snowglobe scene? You can be a craft maven by Christmas. Need more inspiration? Here are some ideas. OK, you can get these online and at the library for free. But think vintage! a. Underwear, shoes, or socks. Buy these new. b. Anything that looks dirty or stained. In need of a stitch or two is OK, if you know how to fix it. c. Something that is just OK. It’s not just about the thrift; it’s about being fabulous. If it isn’t absolutely head-turning fabulous, leave it for somebody else. d. A piece that doesn’t fit you right now. And there you have it. Thrift store shopping, done right, is the perfect hobby. It can be a combination of budget-friendly socializing, gift shopping, clothes shopping, and craft shopping! And when you’re done, don’t forget to reward yourself with that cup of coffee.